Pyramids are shipped in tiles wherein 1 TILE = 2 Pyramids (put together). (Ex. You ordered 24 pack; you will receive 12 tiles) Multiple orders may either be shipped in separate packages, or combined, depending on the quantity. Size: 2" x 12" x 12" ; Noise Reduction: 80-90%; Color: Charcoal Eliminates Standing Waves And Flutter Echoes ; Reduces Unwanted Reflections; Reduces Unwanted Reflections Good for studios, recording studios, vocal booths, control rooms. 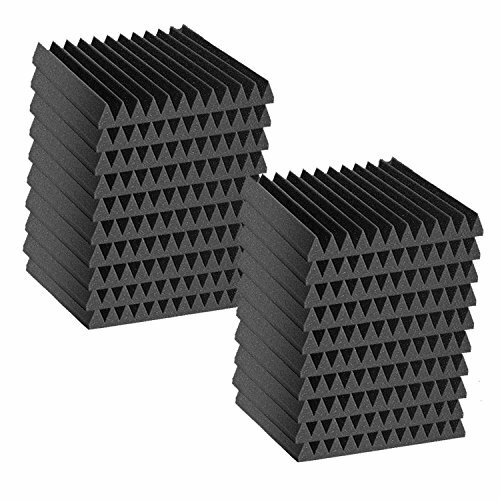 Product Care: Occasional Vacuuming of Dust MYBECCA ACOUSTIC FOAMS (wedges, eggcrates, pyramids) are effective sound deadener for standing waves and flutter echoes, especially when used with ACOUSTIC CORNER BASS TRAPS. It also reduces slap-back and room ring when used in medium-sized areas like isolation booths, recording booths, control rooms, and sound studios. :: With its straight-cut sides, these Acoustic Foams can easily be arranged side by side on a flat surface area (walls). ::: FOR DECORATIVE PURPOSES, wedges, eggcrates and pyramids can also be arranged side-by-side with the acoustic bass traps, corner bass traps triamp and other bass acoustic foam.